Lent: What is the value of penitence? "Penitence" isn't something we discuss much these days. To clear up any confusion with similar words: penitence is an attitude of humility about ourselves, an awareness of our own struggles and imperfections, and a renewed dedication to reject any harmful or unkind thoughts, attitudes, and practices by cultivating the loving and holy things that are born of God's word. So much of that is foreign to our culture. Then again, we're called to live as foreigners and strangers in this world, living not by the standards and practices of the passing secular fads, but as citizens of the kingdom of God, and ambassadors of the kingdom of God. So rather than dial back, let's press on: the first foreign concept is humility. Humility is not an unhealthy self-loathing that uses our flaws as a pretext for self-hatred or self-abuse, but instead a healthy self-awareness of our own imperfections, leading to a compassion towards both ourselves and others. We reject the idea of being "better than" other people even within our own minds. We reject the idea of being "better than" other people without rejecting the idea that some actions are truly better than others. While modern seculars see the opposite of "judgmental" as "tolerant" -- anything goes! -- I'd suggest that the opposite of "judgmental" is "humble": not anything goes, but the line between right and wrong actions, right and wrong attitudes, is not used to divide people from each other, not used as a tool of control, belittlement, harassment, ostracism, or exclusion. Instead, the honest recognition of our faults makes us brothers and sisters with each other, every last one. And it does this without losing the idea that there is such a thing as good. The problem with being judgmental is not placed on the ideas of right and wrong, but on the attitude of arrogance. In the almost-foreign idea of penitence, we have to stretch beyond our modernist shrinking spiritual world to reclaim another almost-foreign idea: sin. Remember that in embracing humility we have already rejected the practice of spiritual arrogance. Someone who does not treasure humility cannot approach the concept of sin without doing grave damage to themselves or others. (I suspect that's a large part of why the very idea -- that there is such a thing as "sin" -- is shouted down fiercely in some circles, or redefined as something that other groups do. Anything to protect ourselves from that self-awareness of our own flaws.) The concept of sin includes some thoughts that are at odds with the prevailing winds of our times: that there really are legitimate moral standards, ones which are true and right -- and universal. It's not possible to have real repentance without a concept of legitimate moral standards. Some of the traditional practices of Lent are beginners' exercises in humility and self-control, such as modest levels of fasting and prayer. A short fast can awaken us to how much we can be controlled by even simple and healthy appetites, and how little harm is done by taking a break from self-indulgence as we tell ourselves "no" in an area where it's typical for our society to have little self-control. When it comes to our own faults, penitence opens our eyes. When it comes to others' faults, our self-awareness in turn opens our hearts. Penitence is a fellowship-builder. Penitence is a door-opener. In recent years in Lent I've spent some time struggling with forgiveness. At the start of Lent I set my mind to a more focused self-examination, this year watching for negative thoughts directed toward other people, and finding out why my mind turned that direction so I can trace the problem to the root. And fairly early on, I caught myself noticing that someone else in my team at work had gotten caught making a mistake; I was noticing with a level of gladness -- almost satisfaction -- that was just not right. And when I checked myself to see why I was glad that someone else was caught making a mistake, it turned out to be an obvious thing: I was glad it wasn't me. Recently at work I've moved into a new group, using new tools and a different programming language than I'd worked in for some time, a new product framework -- and that's all part of the job. Almost any job requires of us that we continue to learn or even retrain ourselves in our spare time, especially in any computer-related field. But this time was different: instead of retraining all the staff together, they generally hired new people fresh out of school with knowledge of the particular language that they wanted, leaving those of us who had built the existing product to maintain it. Business-wise it makes some sense; career-wise there was a growing collection of us wondering if we'd just been sidelined. Slowly, they're coming to let more and more of us retrain for the new product. So while I was retraining this time, besides the enjoyment of something fresh to learn, I also found myself pained by the learning curve -- or, honestly, pained by the embarrassment of being in a situation where I was inexperienced and prone to beginners' mistakes, far from the depth of expertise that I had in my prior work group. I'm still newest to the specific team where I work, but I've got a decent foundation now. So when someone who had been on that team a couple of years longer had made a mistake, I was glad that I've passed that stage in the learning curve where I'm the least competent. My gladness to see someone else make a mistake came from the horribly ungenerous thought, "I'm not the worst one in the group." It came from doubting that I belong, doubting that I'm welcome, doubting that others see me as worthy of being there. The odd thing was that I recognized the thought, a variation of "I'm not the worst one here." I wonder how often a critical thought has crossed my mind about another person for the exact reason that I'm trying to prove to myself that I'm not the worst one there. In different situations it will be different, but I seem to be looking for proof that I'm not the most socially awkward, or not the worst-dressed, or any other area where I carry a lot of self-doubt. In my mind, I was thinking of shame like that old children's game "hot potato": if I could find someone else to hand it to, I get off free. I'm trying to take this awareness and build compassion for whoever is caught holding the hot potato. We've all been there. Note: With Lent beginning this week, this will be the last post on technical analysis of various interesting non-Biblical documents until after the celebration of the Resurrection. 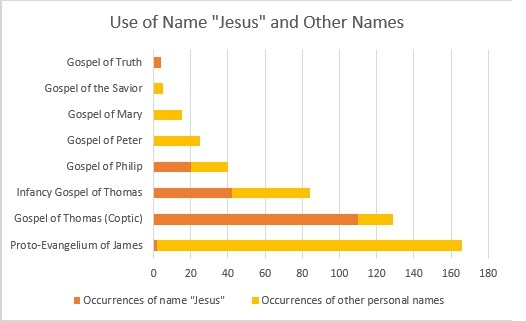 While I'm still developing my skills with various charting tools -- and may evaluate some better ones -- it also helps with perspective on these documents to see how often the name Jesus is used compared to other names. These documents run the full spectrum from "Jesus" being the only personal name used to "Jesus" never being named. 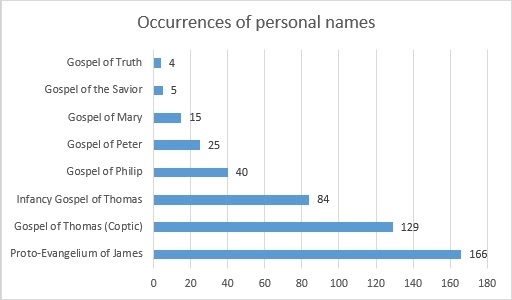 They also cover a wide spectrum of documents that scarcely name any people at all (whether Jesus or anyone else), to ones that focus heavily on people and actions, though not necessarily on Jesus. Several of these documents are incomplete, with missing fragments or pages. If there are future discoveries that lead to more complete documents, that would enable us to make a more complete assessment. These documents show a wide range of difference in how much Jesus is quoted, ranging from "not at all" in some of the documents that we reviewed last week, to "almost all of the content" in the Gospel of Thomas, which largely consists of a collection of sayings. 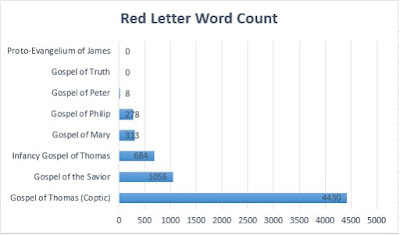 As the Coptic Gospel of Thomas distinguished itself earlier as being the one that mentioned the name Jesus more than the other seven combined, again it distinguishes itself here as having more sayings attributed to Jesus than the other seven combined, by a considerable margin. 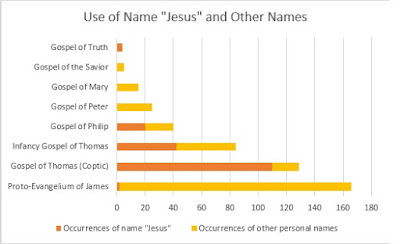 While the sayings attributed to Jesus in the Gospel of Thomas are largely familiar from the canonical gospels, still the material does raise the interest in the Gospel of Thomas as more nearly the same type of document as the Biblical gospels, where the document intends to relate information on the life and teachings of a historical Jesus.